Noise and Vibration Coatings are applied for lowering sounds and vibrations from machines and automobiles, these coatings are basically water based compounds that comprise of VOC compliant and noise reducing paints. Factors such as low toxicity, non-flammable nature, high corrosion resistance, good thixotropic properties and high temperature resistance have made them attractive in the automotive and heavy duty machine industries. The application of these coatings in transformer, HVAC systems, Heavy duty automobiles, motors and grinders make them highly striking to automotive manufacturers. Noise and vibration coatings are usually available in the market in spray and paste forms. Lowering of noise and vibrations in heavy duty machineries helps in more efficient and smooth working of labors in large equipment industries. Additionally, government regulations regarding the decibels of noise that can be generated from specific equipment has resulted in an increased demand for noise reducing agents as noise and vibration coatings in automobiles and heavy duty equipment industries. Vibration dampening liquid coatings possesses chemical resistance, viscoelasticity, and chip resistances that make manufacturers adopt these coatings for various purposes in industrial application. These sound and vibration dampening coatings are also available in various colors. Noise and Vibration Coatings Market is anticipated to record a CAGR of 6.8% over the forecast period. Many multi-national companies are concentrating towards new product advances in noise and vibration coatings. Moreover, the many advantageous properties of noise and vibration coatings are exploited in the field of automotive and heavy duty industries now and then. New uses for noise and vibration coatings derivatives are discovered on regular basis which is expected to drive the Noise and Vibration Coatings market rapidly. Currently the global noise and vibration coatings market is observing vibrant growth owing to increasing demand of vibrations and noise dampening agents in the market. Advances in automobile industry in the past few years and growing technological explorations are projected to drive noise and vibration coatings market besides the wide range of functions of noise and vibration coatings in an immense range of products such as foamed feed chutes and hoppers, machinery and belt guards, fan & blower housings, vacuum cleaners and more during the forecast period. On the basis of regional platform, global Noise and Vibration Coatings market is segmented into five major regions including North America, Europe, Asia Pacific, Latin America and Middle East & Africa region. As a precursor to noise dampening agent in rough and heavy duty industry, North America is panned to observe substantial noise and vibration coatings market growth due to rising noise and vibration coatings usage. North America is expected to be followed by Europe in terms of consumption due to expanding noise and vibration coatings requirements in military, transformers and transportation equipment manufacturing industries. The rising demand for noise and vibration coatings in various end-user industries, such as marine, automotive, oil, aviation and aerospace, is estimated to showcase a steady growth of the market over the forecast period. The use of noise and vibration coatings in heavy consumer products is predicted to propel the market further rapidly. The use of these coatings on metals for corrosion resistance is predicted to expand the applications of noise and vibration coatings across end-user industries. Additionally, the application of noise and vibration coatings suitable for work vehicle, food-processing area, container, tank, and heavy-duty machinery coating is expected in greater market expansion across the globe over the forecast period. The use of noise and vibration coatings in machinery & belt guards, transportation equipment surfaces, feed chutes & hoppers, parts tumblers & vibratory conveyors, fan & blower housings is anticipated to display a vibrant growth rate over the forecast period. 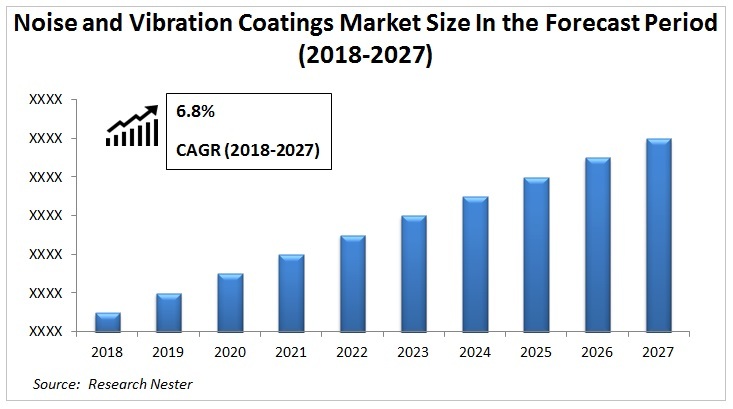 However, presence of alternatives such as fiberglass isolation pads and isolators, spring isolators, sound control baffles or panel absorbers and other equipment used in heavy machines for vibration and noise absorption can pose as the key restraint in the growth of the noise and vibrations coating market during the forecast period.